In groups of 4 to 6, students share information provided them on strips of paper to complete various details about five homeowners. 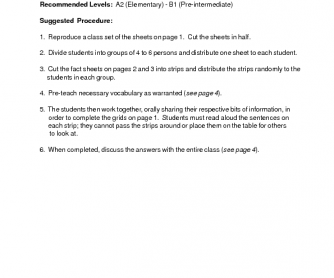 As the information given on each strip does not provide sufficient information to complete the activity, students must work together effectively and combine the various bits of information provided to accomplish the task. Suggested procedure, useful vocabulary to pre-teach and an answer key are all provided.